So Nissan and Panoz are fighting it out over whether or not Nissan’s ZEOD RC electric race car is a copy of the DeltaWing design and now, just a few laps into the race, the non-electric part of the car failed. Is Don Panoz a voodoo witch doctor? You can see the ZEOD RC getting a push above, which is a bummer because it’s this year’s experimental car and we always like to see those do well. 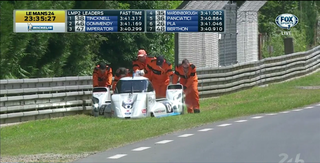 Driver Lucas Ordonez said the gearbox failed, meaning there’s a working EV system but a mechanical system failure. Such is the 24.